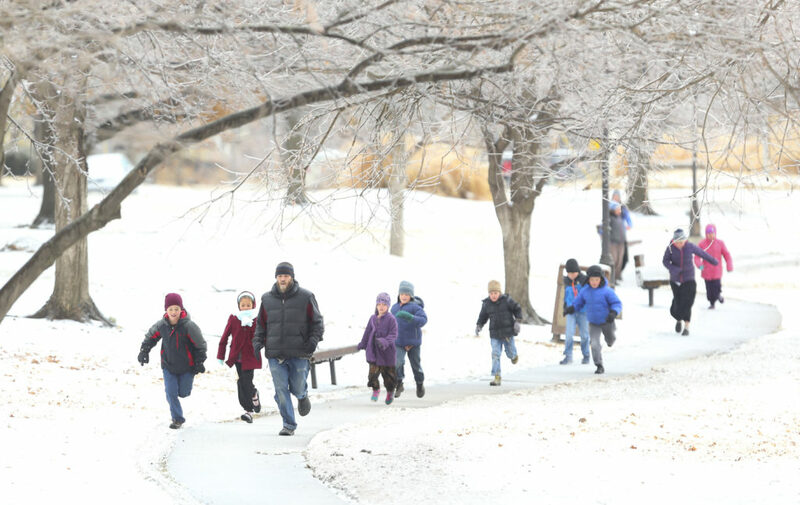 Lawrence resident, Dayag Anashiym, leads a line of 11 homeschooled children on a quick jog around the slushy path at Buford Watson Park, on Tuesday, Feb. 20, 2018 in downtown Lawrence. The Lawrence area can expect another round of wintry weather after freezing rain and sleet made for a dicey Tuesday morning commute. John Woynick, meteorologist for the National Weather Office in Topeka, said about 0.2 inches of icy rain and a quarter-inch to a half-inch of sleet fell Tuesday morning in the Lawrence area. The “thunder sleet” was associated with warmer air that came in on top of a cold front that caused temperatures in northeast Kansas to fall sharply on Monday morning. 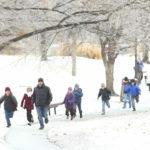 Temperatures are forecast to top out at 33 degrees Wednesday afternoon before another round of wintry precipitation visits Lawrence and Douglas County, Woynick said. The forecast calls for about half an inch of snow or sleet to accumulate from about 5 p.m. until midnight Wednesday. Tuesday’s wintry mix fell during the morning commute, but local drivers appear to have handled it well. As of 5 p.m., the Kansas Highway Patrol crash logs showed that nine injury accidents occurred Tuesday in Kansas, but none happened on Douglas County roadways. Sgt. Kristen Channel, of the Douglas County Sheriff’s Office, said deputies responded to about 20 reports of accidents Tuesday. Only one of those accidents involved damage to a vehicle, she said, and most of them involved cars that had slid off the roadway due to the icy conditions. 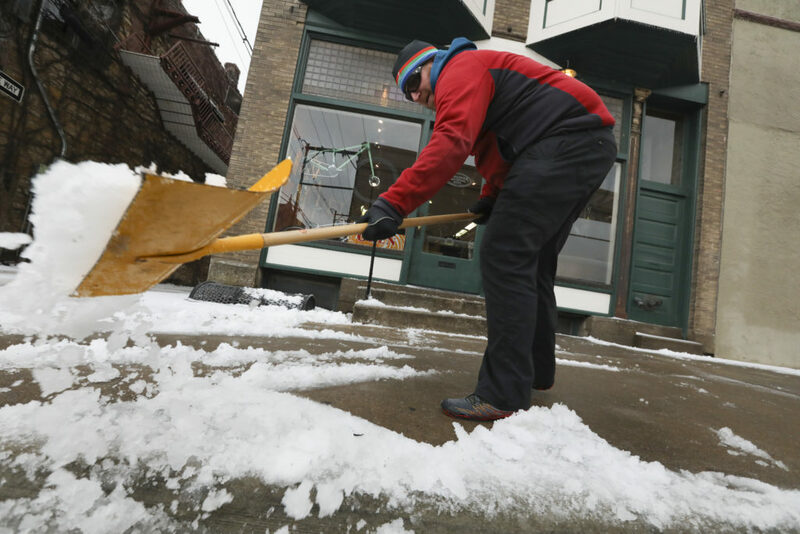 Sunflower Outdoor and Bike employee Keith Muller shovels slush from the sidewalk outside the Bike Shop entrance on Eighth Street, Tuesday, Feb. 20, 2018 in downtown Lawrence. On Tuesday afternoon, Lawrence police Sgt. Amy Rhoads said there had been nine accidents reported in Lawrence since 6 p.m. Monday. 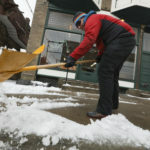 Woynick said the gloomy weather would stick around through Saturday, with a 30 percent chance of snow overnight Friday and the same chance of rain Saturday. He said sunny skies will return Sunday to northeast Kansas, with afternoon highs in the 50s and 60s through the early part of next week. University of Kansas freshman Christina Boswell, of Austin, Texas, scrapes a layer of ice from her vehicle on Tuesday, Feb. 20, 2018 at a downtown parking garage. Boswell, like many others in town, spent part of the morning dealing with Tuesday’s wintry mix of ice and slush. 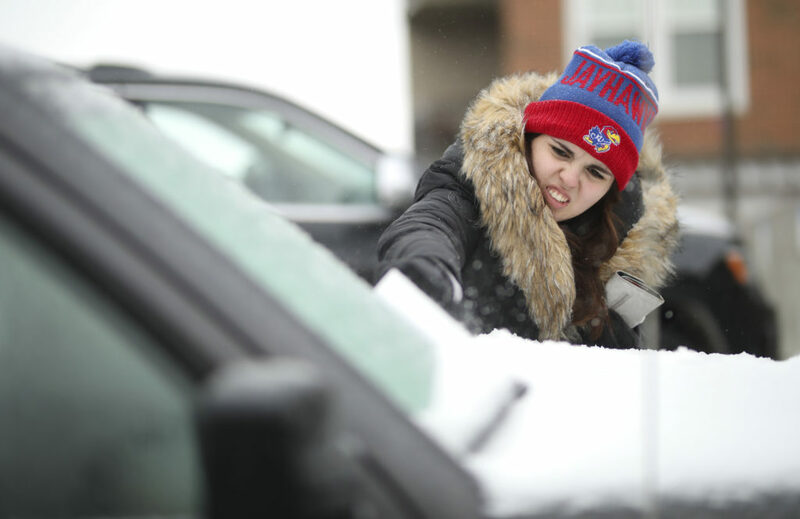 University of Kansas freshman Christina Boswell, of Austin, Texas, scrapes a layer of ice from her vehicle on Tuesday, Feb. 20, 2018 at a downtown parking garage. Boswell, like many others in town, spent part of the morning dealing with Tuesday's wintry mix of ice and slush.